The Saltley (or Birmingham) Reformatory School for Boys was originally established in 1852 in a house on Ryland Road, Edgbaston. It was instigated by Quaker reformer Joseph Sturge who in 1850 had visited an industrial home for vagabond children at Hamburg called the Rauhe Haus (Rough House). At the end of the following year, he attended a National Conference held at Birmingham to promote the founding of reformatories. There he heard about John Ellis, a teacher in a London 'ragged school' who had for some years been employing convicted thieves in his trade of shoemaking. Sturge persuaded Ellis to take charge of an experimental reformatory in Birmingham. A house was obtained and sixteen of the worst young gaol-birds, leaders of gangs of thieves and others, were obtained from the police and placed there in residence. The results appeared to be successful and a committee was formed to take over the responsibility for its management. The venture received considerable support support and considerable financial help from local land-owner and MP Charles Adderley (later Lord Norton) who funded the construction of permanent premises on Fordrough Lane, Bordesley Green. On August 26th, 1854, the establishment was certified under the Reformatory School Act of that year to receive up to 105 juvenile offenders sentenced by magistrates for between two and five years. Boys could also be admitted on a voluntary, fee-paying basis. Inmates of the School were given basic classroom education and Industrial Training in a variety of manual and craft skills such as carpentry, shoemaking, and farming. The location of the home is shown on the 1905 map below. Birmingham Reformatory site, Birmingham, c.1905. THE REFORMATORY SCHOOL AT SALTLEY, NEAR BIRMINGHAM. The institution was commenced in a very humble manner, but with a thoroughly practical aim, in a house in the Ryland-road, and was for several months most satisfactorily carried on there. It has since been removed to Saltley, where Mr. Adderley has erected a suitable house for the inmates, and generously appropriated five acres of valuable land for their training in agricultural pursuits. The object of the school is by this time probably well known, but it may be useful to re-state it. Boys and youths who have been unmistakably thieves, and whose vicious propensities have more than once led to their becoming inmates of a prison, and even exposed them to the extreme punishment of transportation, are taken direct either from gaol, or from the lowest and worst dens of wickedness, and placed under the superintendence of a master whose duty it is to see that they are employed in useful honest labour, and that by degrees the principles of virtue are imparted to their minds, not by any mental or moral forcing process, but by a gradual progression of labour, and by a strict discipline, administered with firmness and tempered by a kind and manly feeling. The school now consists of 21 pupils, whose ages range from 10 to 19 years. Of these 15 reside in the house at Saltley and six remain for the present in Ryland-road, three of them working as shoemakers, two as tailors, and one employed in the town and supporting himself. The boys at Saltley are at present exclusively engaged in agriculture, but it is intended at once to commence the erection of workshops for tailors, shoemakers, and carpenters, that they may be instructed in those trades, and, when these erections are complete, the whole will be removed to Saltley. All the boys, it should be mentioned, with the exception of one who came from Bristol, have been received into the institution from the Birmingham Borough Gaol. The Ryland-road house has hitherto been retained as a "rough" house, in which the boys are placed before being permanently located in the chief establishment. The building at Saltley, which presents the appearance of a substantial farm-house, is durably constructed of red brick, in the plainer Tudor style, and comprises a dining-room about 40 feet by 12, with a dormitory above of the same dimensions, and has also a master's parlour, bed-room for the matron, and the customary out-offices. The furniture is of the simplest description — a couple of stained deal tables and a few forms in the lower room, and ingeniously swung hammocks, a separate one for each boy, in the dormitory. Every inmate has likewise his particular clothes chest, marked with his name. Ornaments are entirely absent, except two or three Scripture prints in the dining-room; the intention of the committee evidently being to accustom their protégés to the accommodation they will probably have to meet with in their progress through life. The food supplied to them is simple but abundant, and is seasoned with that best of sauces, labour, tor there is a strict observance of the rule, "If a man will not work, neither shall he eat." Master and pupils rise at six o'clock, and the latter work in the field, under the superintendence of an intelligent and well-trained labourer, until eight, when they breakfast. A chapter in the Bible is then read and prayer offered, after which work is resumed until half-past 12, when dinner is served, and is again succeeded by work until about five. The remainder of the evening is devoted either to amusement or instruction; the latter is shortly to be placed under the direction of the industrial master from the adjacent Training College On Sundays the boys attend Divine service at Saltley Church, and in the afternoon of that day some of the college students afford them instruction proper to the season. Once a week the inmates are allowed to visit their friends, and so far are they from manifesting any desire to escape, that it is no unfrequent occurrence for them to return with half-a-dozen of their former companions, for whose admission they strongly intercede. A thorough system of self-government has been adopted in order to impart to the pupils independent and thinking habits. Twice a week they assemble, under Mr. Ellis's control, to hear complaints and redress wrongs, and if even the weakest boy feels aggrieved, he meets with a tribunal ready to administer justice. Supposing, for example, that a boy has thrown a stone, or used improper language, his fellows inquire into the offence and determine the penalty, and this passes into a law to be applied to all ordinary cases of a similar description. When their decisions are sanctioned by the master they acquire the force of byelaws, and a few words of reproof and admonition from Mr. Ellis, or, in extreme cases, a hint at expulsion, is sufficient to bend the most stubborn will, for there is nothing they dread so much as the withdrawal of the privileges they enjoy. The introduction of this family principle has produced the most beneficial results. At first the elder boys attempted to tyrannize over the younger, and those who had known each other before used the old nick-names; swearing was very prevalent, and fighting frequent; but finding that they were associated as a family, the boys began to feel affection for each other, and to regard their master as a father. Acted upon by his example, and that of his son, a remarkably intelligent youth about 13 years old, they became peaceful and moral, and when one of their number had grossly overstepped the rules, and been expelled, the others have begged his re-admission with as much earnestness as they would display for one who was really their brother. Fights are now unknown, and swearing very rarely occurs. The process of reformation has been materially aided by the manner in which emulation is induced, rather than inculcated. When the colony entered on its new house, about June last, each boy had allotted to him 20 square yards of land as a garden, and Mr. Ellis offered a prize of 1s. for the best and earliest bunch of radishes. The prize was eagerly competed for, the youthful gardeners working in their leisure evening hours, and some of them rising an hour earlier in the morning. Proud indeed was the winner, but still more elated was the gainer of a yet higher prize. In order to foster habits of voluntary industry, a prize of 5s. was offered to the boy who could show the best kept garden on the first of the present month, 2s. 6d. to the second, and 1s. to the third best. The result of this has been that all the gardens are well kept and it became a matter of no small difficulty to decide to whom the prizes belonged. They were therefore, adjudged by a neighbouring farm bailiff; his decision was in its turn submitted to the boys at their weekly meeting, and they unanimously acquiesced in it. A piece of ground is now being broken up into gardens of about 250 square yards, one of which will be allotted to each boy, who will be supplied with seeds, and will then be allowed to sell the produce of his ground, which he must cultivate in his leisure time. Some of these allotments are already tenanted, and their occupiers were during our visit as busily employed as emigrants newly settled in the bush. The little farm, for so it may be called, is in the best order, and, thanks to the excellent spade husbandry bestowed upon it, has produced a fair crop of vegetables. The land has been twice dug, trenched and pipe-drained, and the history of the drainage proves how much reliance may be placed upon the efforts even of boys. They commenced the task on the 18th of November last, and when it was known that they intended thoroughly to drain the land, even experienced persons laughed at the idea, for the sod is a stiff clay, and the drains were to be laid four feet deep. However, the master, Mr. Ellis, took the spade in hand, and followed by his troop of obedient boys, commenced the work, which was really of the hardest kind. A large drain was dug across the field, and then 12 other drains were laid to flow into it, and those who laughed were proved for once to be in the wrong, for these boys, who had never touched spade before, effectually drained the field by laying in the course of about two mouths, nearly 1,600 yards of tile drains, four feet deep in the clay. In 1890, the School's object was stated as being 'To receive, educate, maintain, employ, and reform criminal boys from all parts of the kingdom, and train them to habits of regular industry.' The age of admission was now stipulated as being 12 to 16 years, with certificates from relevant prison authorities and medical officers being demanded. A payment of two shillings per week was required in addition to the allowance the School received from the Treasury. After the death of Lord Norton in 1905, the School was renamed the Norton Boys' School. 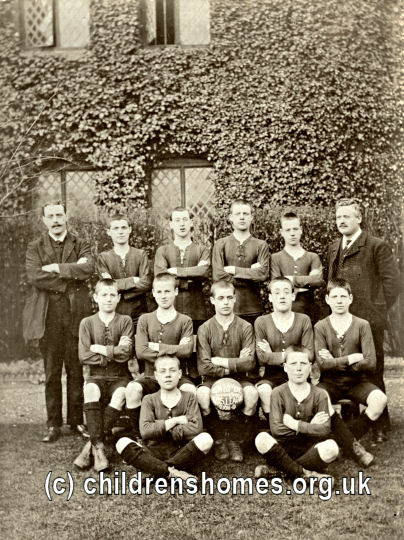 Sporting activities became a prominent feature of life at the School and its football team played against other local sides. In 1933, the School became one of the new Approved Schools that were introduced by the 1932 Children and Young Persons Act to replace the existing system of Reformatory and Industrial Schools. The establishment was designated to receive up to 100 Senior Boys, aged from 15 to 17. Industrial Training at the School now included cabinet-making, carpentry, engineering and gardening. At the start of the Second World War in 1939, the Saltley premises were taken for use over by the General Post Office and the School was evacuated, first to Suffolk and then to Machynlleth in west Wales. The School never returned to Saltley but resumed operation after the war at Kineton House, Little Kineton, midway between Stratford upon Avon and Banbury. In 1973, the School became a Community Home with Education under the control of the Warwickshire County Council. It continued in operation until falling number led to its closure in 1985. The site was then sold, with the proceeds being transferred to the newly formed Norton Foundation for the continuing benefit of young people in the West Midlands. The School's former Bordesley Green premises no longer exist and Birmingham City College now occupies the site. The Little Kineton site has now been converted to residential use. Birmingham Archives and Heritage Service, Library of Birmingham, Centenary Square, Broad Street, Birmingham B1 2ND. Has School records (1848-1982) catalogued under 'MS 244' including administrative and financial records of the school, pupil records, and other items. Annual reports for Saltley Reformatory and Norton Training School, 1851-1938, are located in the Local Studies collection at 'L43.94'. Warwickshire County Record Office, Priory Park, Cape Road, Warwick CV34 4JS. Has a small number of items relating to Norton School, including prospectuses from the early 1980s and estate agents' brochures from the sale of the campus, catalogued at 'CR4094'.